The Los Angeles police officer who had been arrested following a deadly crash in which alcohol possibly played a role was released from custody on Thursday, according to inmate records. It was not immediately clear Thursday evening whether the Calfornia Highway Patrol planned to file a warrant for Verduzco’s arrest. The agency is continuing to investigate the collision and said they are awaiting blood test results.Edgar Verduzco, 26, left Men’s Central Jail in downtown Los Angeles around 5:10 p.m. due to insufficient grounds to file charges, the L.A. County Sheriff’s Department inmate database shows. Earlier in the day, Officer Al Perez with the California Highway Patrol — which is investigating the incident — told KTLA the agency had not yet submitted a formal complaint to the District Attorney’s office and did not expect to before the 48-hour deadline for holding prisoners without a warrant. The Los Angeles Police Department confirmed Verduzco was assigned to his home with pay as the investigation continues. He had been arrested on suspicion of felony driving under the influence and vehicular manslaughter. An off-duty Los Angeles police officer is suspected of driving drunk and causing a three-car crash on the 605 Freeway on Tuesday night, killing a Riverside couple and their son when they could not exit their burning car. The suspect, 26-year-old Edgar Omar Verduzco of Santa Ana, suffered a broken nose. Verduzco was booked on suspicion of driving under the influence and gross vehicular manslaughter, according to California Highway Patrol Sgt. Armando Perdomo. 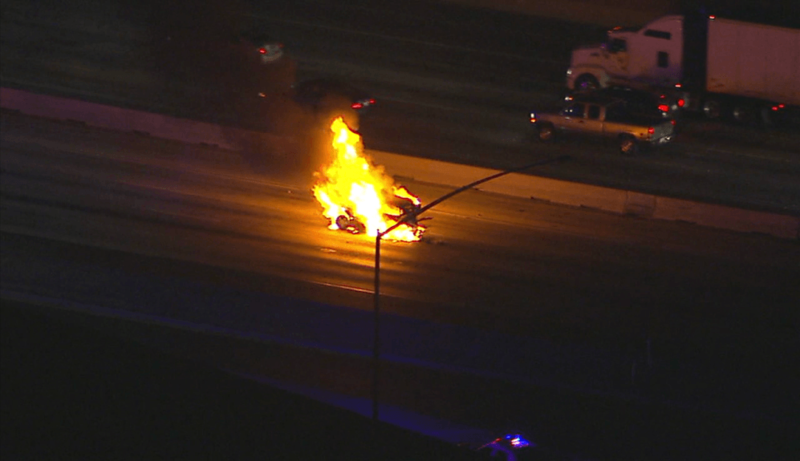 The CHP is handling the criminal investigation. CHP Officer Al Perez said Verduzco appeared to have been drinking. He identified Verduzco as an LAPD officer. 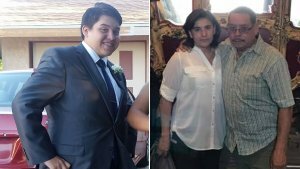 Perez said a couple and their teenage son died in the 10:15 p.m. crash on the southbound 605 Freeway, south of Saragosa Street, in the unincorporated community of West Whittier. But Riverside Unified School District officials identified the young man killed as an employee, as well as a former student, of the district. Grief counselors were sent to North High School as soon as officials learned of the former student’s death, Grayson said. “On behalf of the RUSD Board of Education, our superintendent, and the entire RUSD family, we extend our heartfelt condolences to the families and friends of the victims of this tragedy. There will always be an unfillable void left in our hearts when we lose a beloved member of our RUSD team,” he said. Josh Rubenstein, a spokesman for the LAPD, said Verduzco worked the front desk at Central Division in downtown Los Angeles. 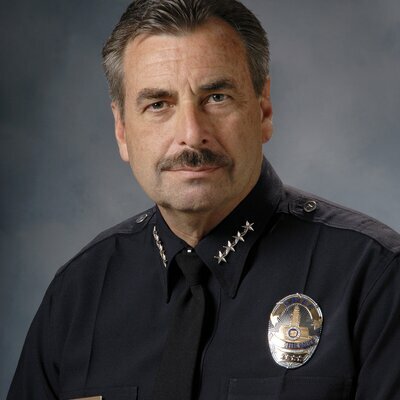 Beck described Verduzco’s two years with the LAPD as unremarkable. Before joining the department, he said Verduzco served in the U.S. Army for almost four years. including in Afghanistan. Beck said he believed the officer was on his day off Tuesday. CHP Officer Gersain Chavez said in a statement that Verduzco was driving his 2016 Chevy Camaro and speeding in the carpool lane of the southbound 605 Freeway Tuesday night. He said the Camaro rear-ended a Nissan in the No. 1 lane and a Scion in the No. 2 lane. 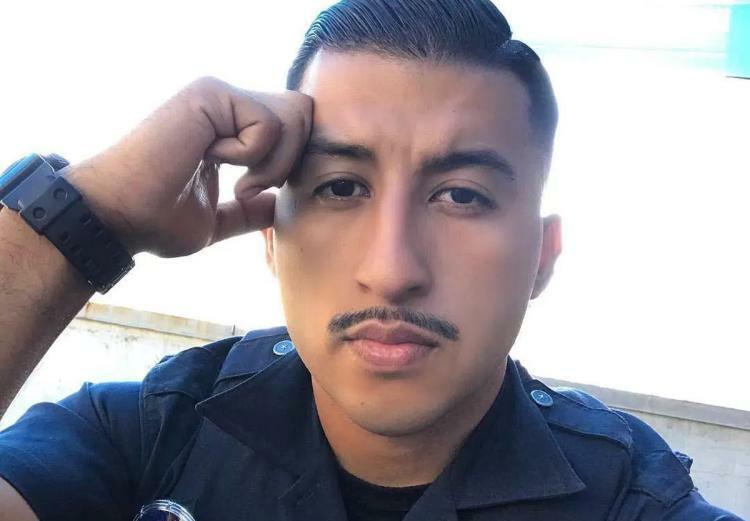 According to KTLA, 26-year-old LAPD Officer Edgar Verduzco’s 2016 Chevy Camaro rear-ended two cars while traveling at high speed on a freeway Tuesday. In one of the cars, a couple and their teen son — Maribel, Mario and Oscar Davila — were killed. They were trapped in their burning Nissan which burst into flames. They died on the scene. Los Angeles: The Los Angeles Police Department has learned that one of its off-duty police officers was involved in a traffic accident on the 605 Freeway late last night, that resulted in the tragic death of three people. According to the California Highway Patrol, who is investigating the crash, our officer was arrested for suspicion of DUI. The Department sends its deepest sympathies to the families of the victims in this horrific collision. The LAPD has initiated an administrative investigation and will work with the CHP as they continue their investigation, however, the Department has no tolerance for driving under the influence and holds its officers to the highest standards of professionalism both on and off-duty. The LAPD understands the significant danger innocent drivers face when any person gets behind the wheel while they are impaired, which is why we conduct random sobriety checks throughout the City. It is particularly troubling when one of our own police officers violates drunk driving laws, which is why a drunk driving offense always results in a personnel complaint which can lead to dismissal. In instances where nobody has been injured, employees often receive suspension days and employees sign a contract in which an individual will submit to randomized testing, treatment programs, and abstinence from alcohol as a condition of continued employment. This entry was posted in Arrest bookings, Cops arrested for Drunk Driving, DWI arrest photos, DWI Arrests by State, DWI crash photos, injury or death and tagged California Highway Patrol, California Highway Patrol Sgt. Armando Perdomo, CHP, CHP Officer Al Perez, Driving Under the Influence, driving under the influence of alcohol, driving while intoxicated, drunk driving, DUI, DWI, John W. North High School, LAPD Chief Charlie Beck, LAPD DUI Officer Edgar Verduzco, Maribel, Mario and Oscar Davil, OWI. Bookmark the permalink.